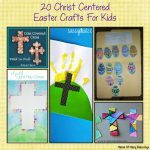 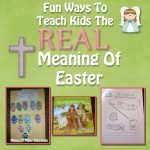 One of the things that I love doing in our homeschool is doing fun activities with our kids to teach them the true meanings of each of the holidays. 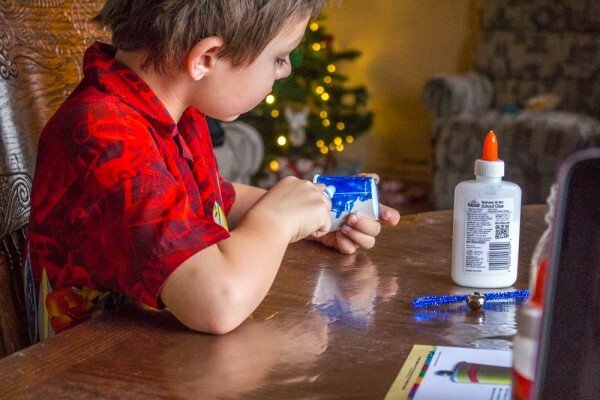 Mother Goose Time always makes sure to include holiday celebrations in their monthly shipments. 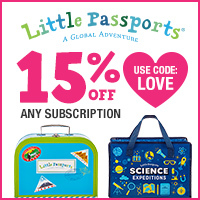 Every month there is a holiday one of your packages will be any holidays celebrated during that month. 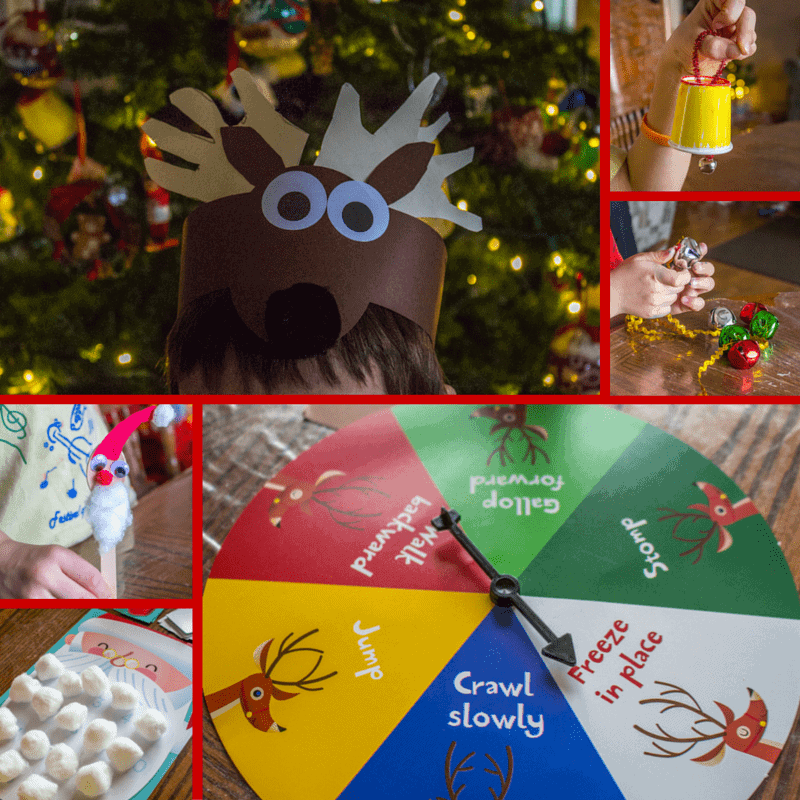 Today I am going to give you a look into our recent festive Christmas learning ideas from our Mother Goose Time curriculum. 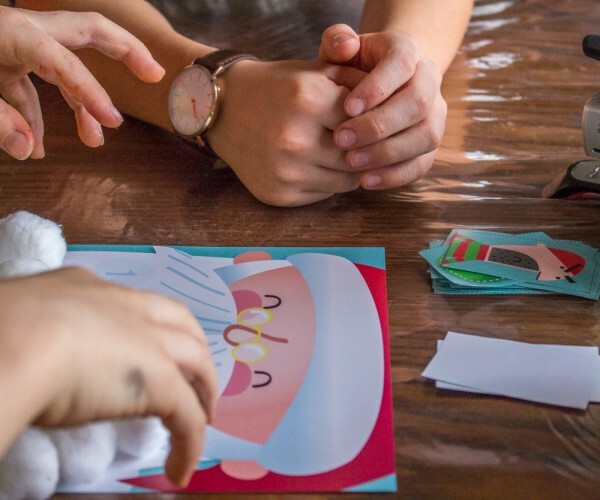 When going over each of the different symbols of Christmas we make sure to talk about what each of them symbolize having to do with Christ’s birth. 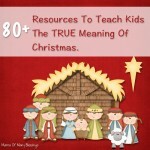 I found this website that does a great job explaining the religious meaning of many of the Christmas Symbols. 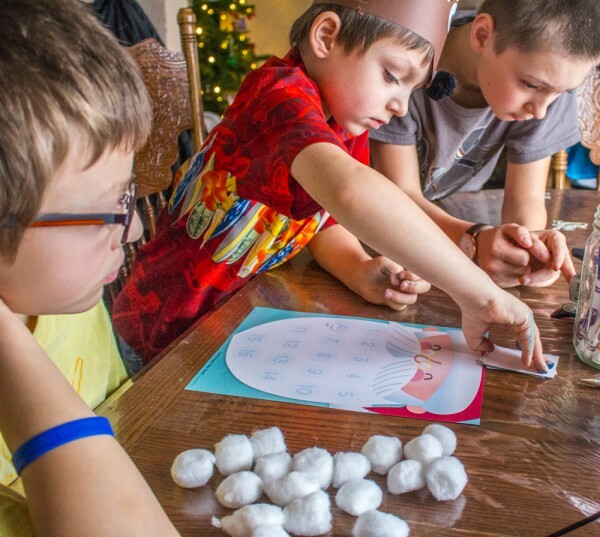 We also watch Buck Denver Why Do We Call It Christmas which does a wonderful job of teaching the kids the meaning behind many of the Christmas symbols in a fun way that kids really enjoy. 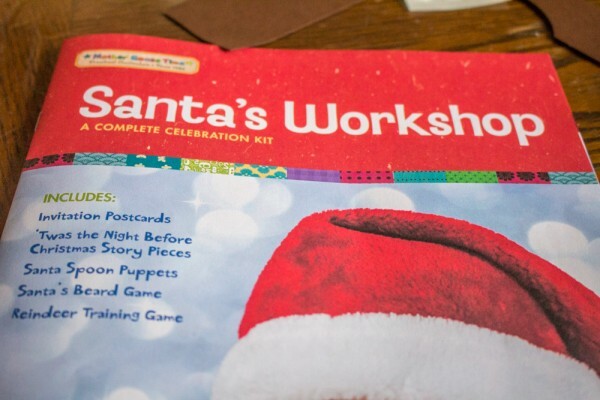 Inside the monthly shipments they include a packaged kit for whatever holidays happened during that month. 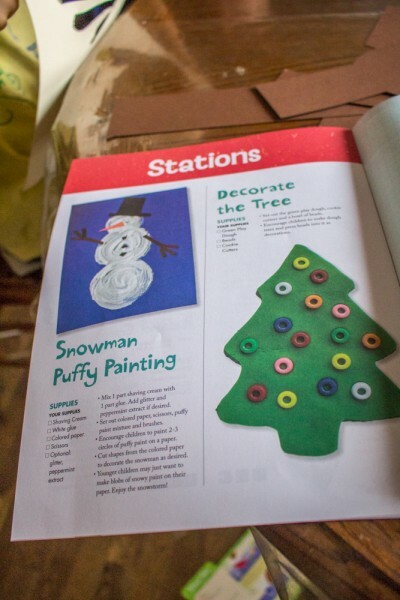 This not only includes the supplies needed, but also the manual to follow for some added holiday fun. 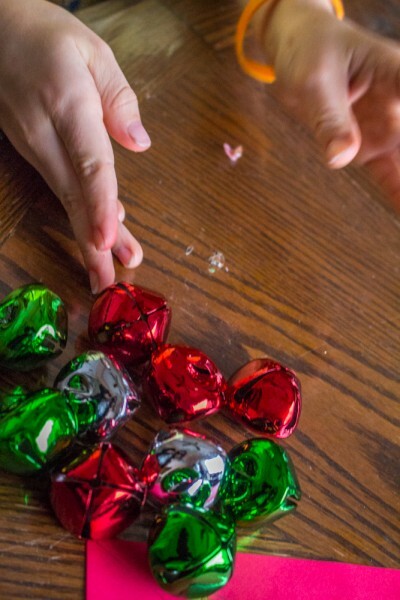 Sometimes we do them well before the holiday, other times we do them the day before. 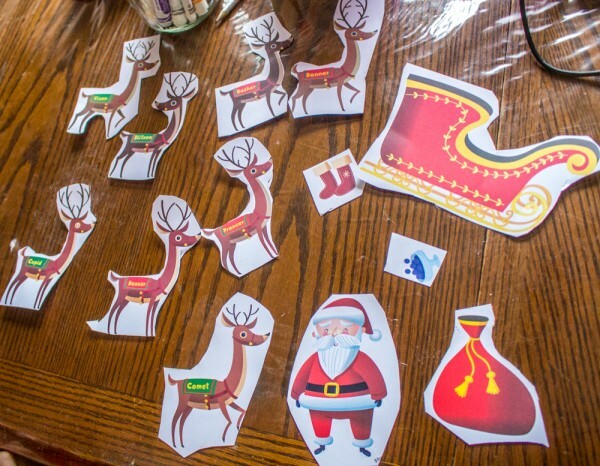 Our Christmas unit we did on Christmas Eve this year which gave everyone fun things to do to keep their mind off of the fun that evening held 😉 ! 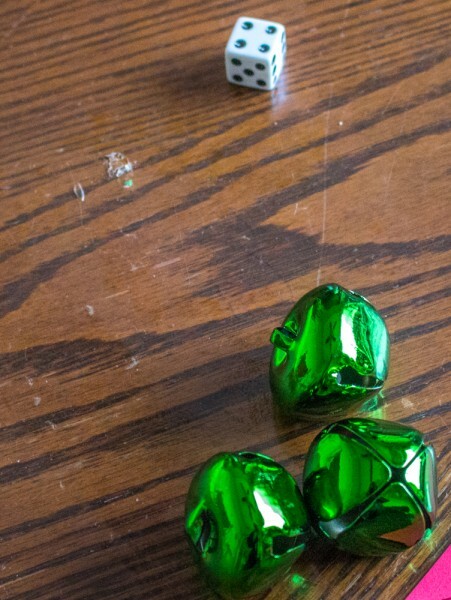 For this activity the kids used a dice and took out that many jingle bells, rolled the dice again and added that many jingle bells. 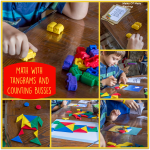 We also made patterns with the bells, and just counted them. 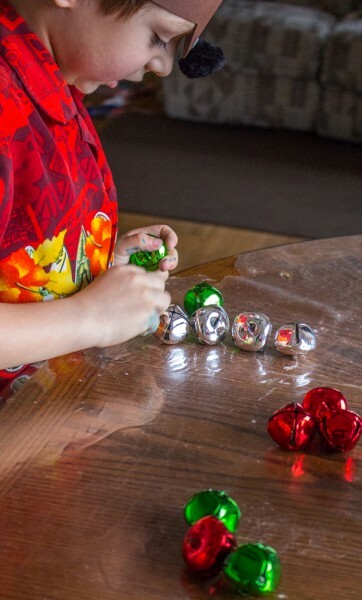 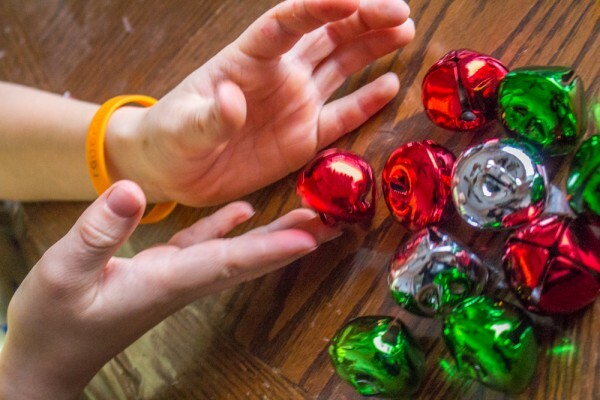 The jingle bells are one of the manipulatives that were included for the month. 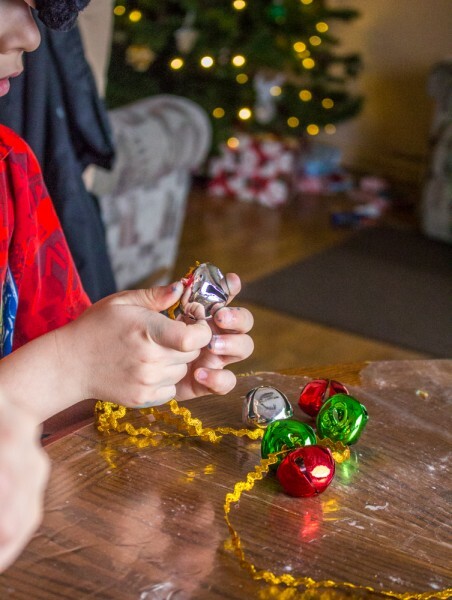 On top of counting with the bells the boys wanted to make a necklace with the bells. 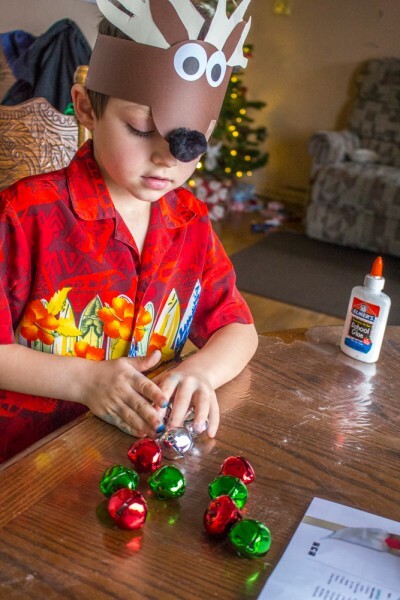 So we found some gold rick rack and they threaded them on. 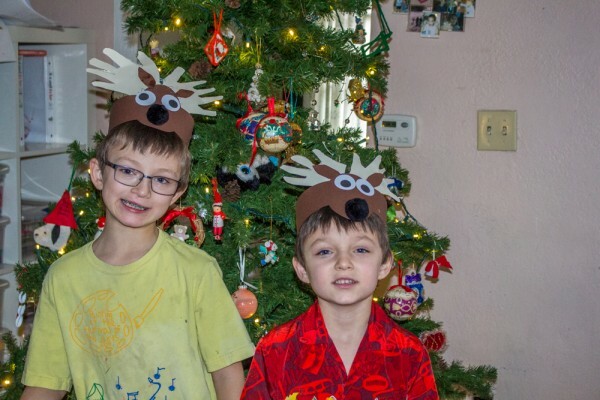 They will be easy enough to take off after Christmas to keep for future years to use as well. 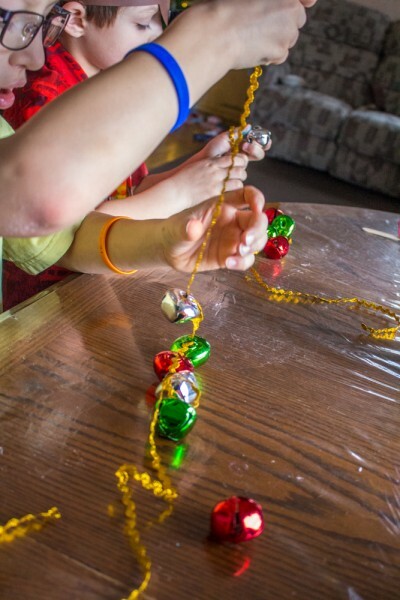 Threading the bells was some great fine motor work for the kids! 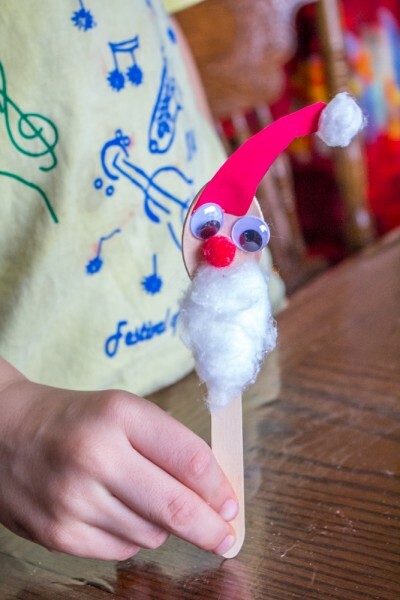 The boys had fun making these great santa puppets using provided wooden spoons. 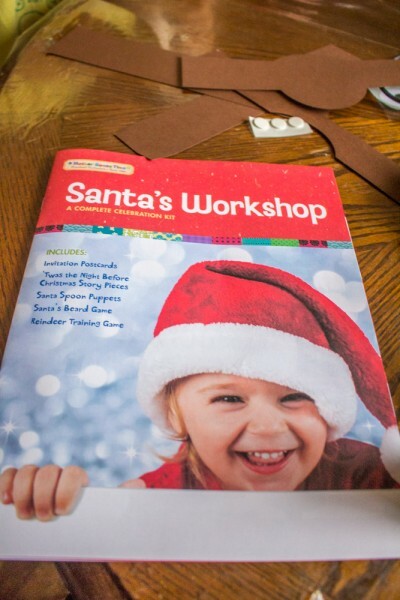 We read through the provided Christmas story which was The Night Before Christmas. 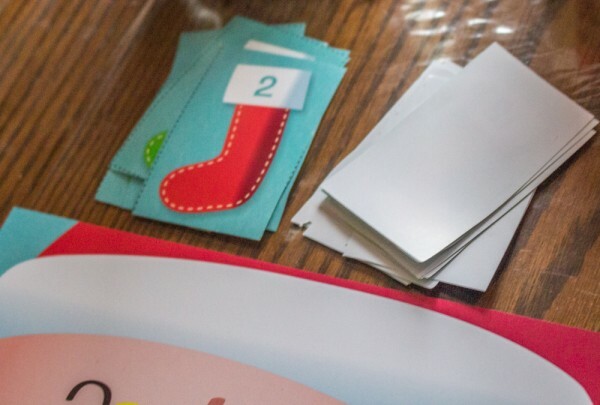 The boys used these story pieces and held them up when we talked about each of them during the story. 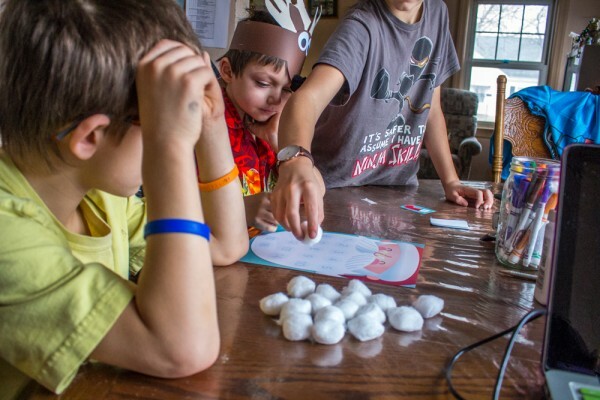 The boys loved this game, big brother Anthony even decided to join us for this game it was such a fun Christmas learning ideas. 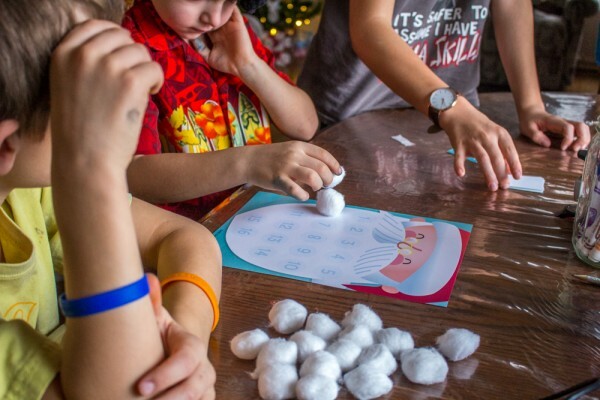 We had the santa game board, stocking numbers, and cotton balls. 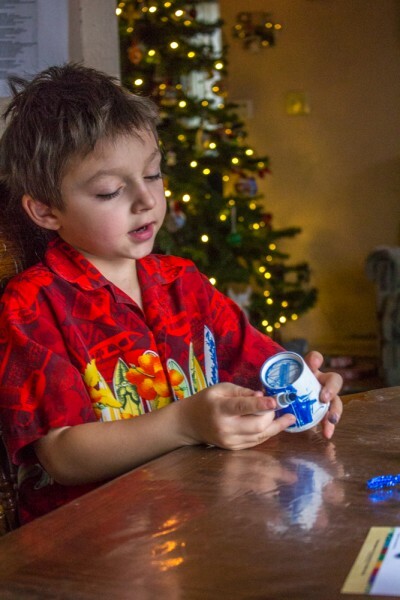 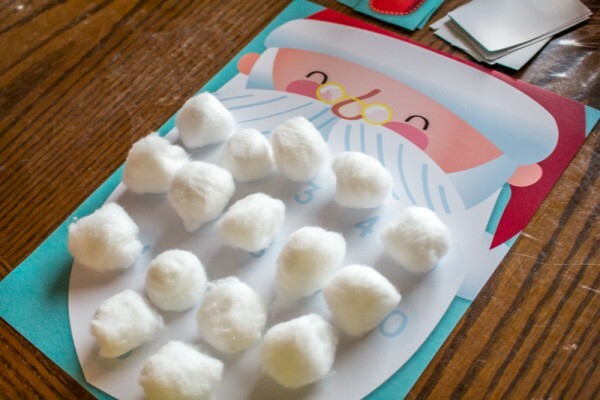 You flip over a stocking to find out what number you put the cotton ball on or off. 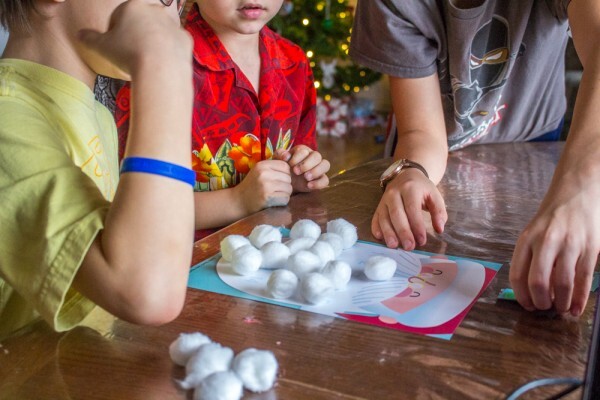 Hidden inside the stocking there was an angry robber, when you get that you had to take off 3 of the cotton balls. 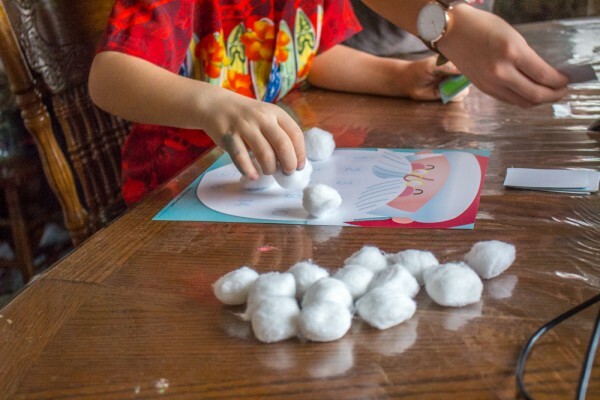 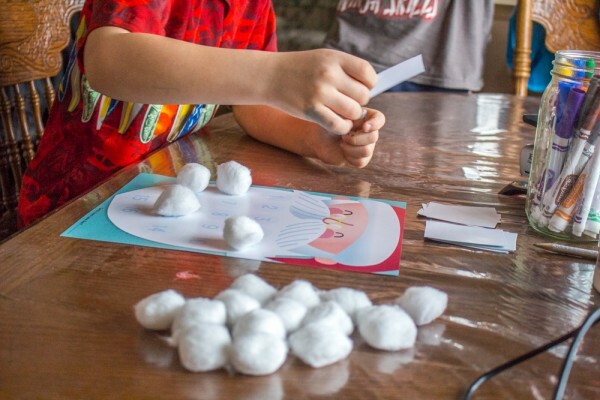 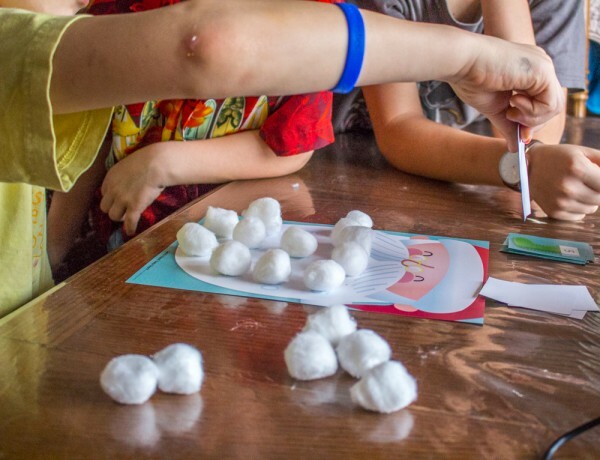 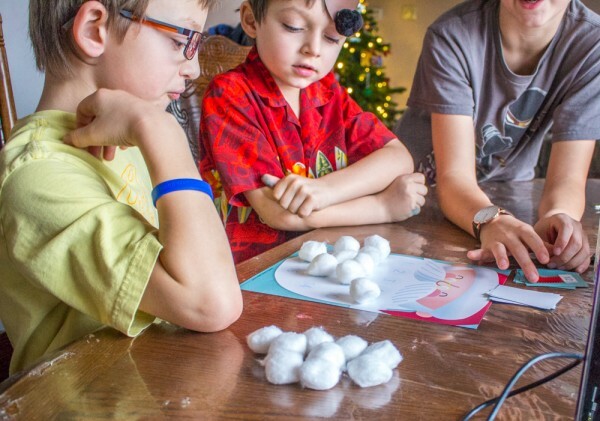 Fill up santa’s beard with cotton balls to finish the game. 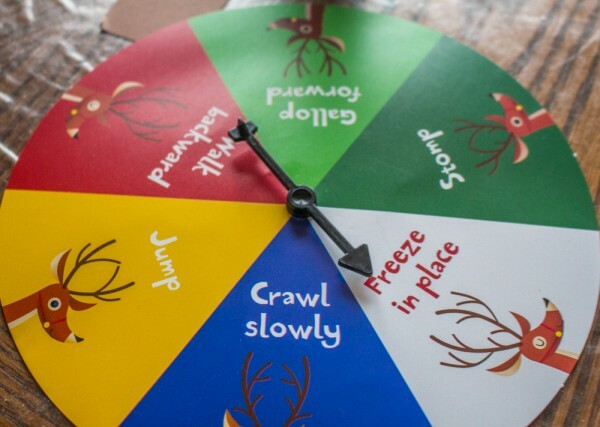 Reindeer training was a lot of fun and a great way to get some energy out. 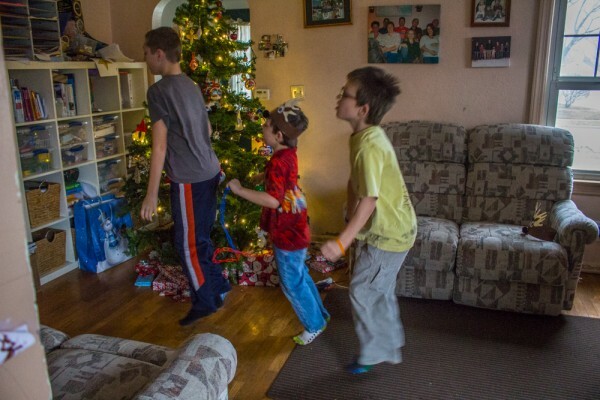 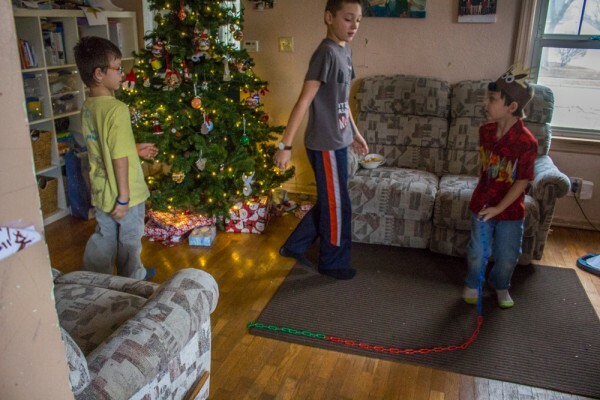 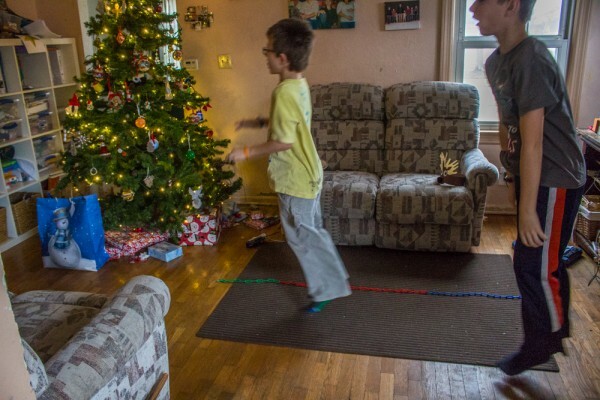 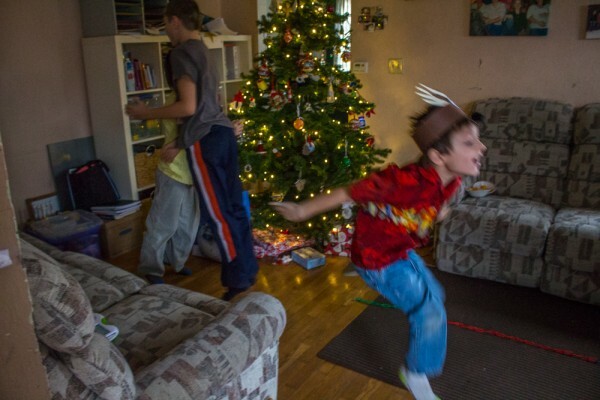 The only problem was that my shutter speed was not nearly fast enough for how quickly the boys would fly around the living room, the photos turned out blurry, but you can get the idea of how much fun they had either way. 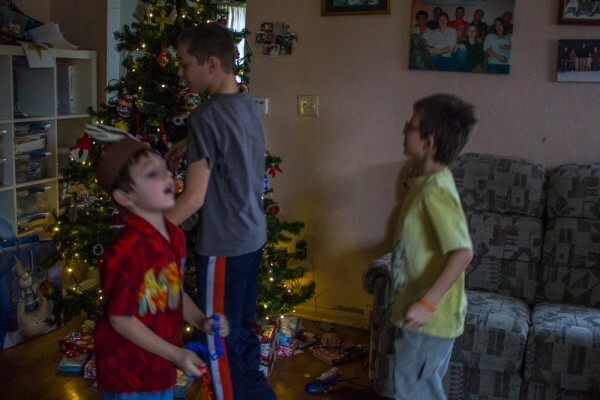 I played Christmas music and kept spinning telling them what they needed to do next. 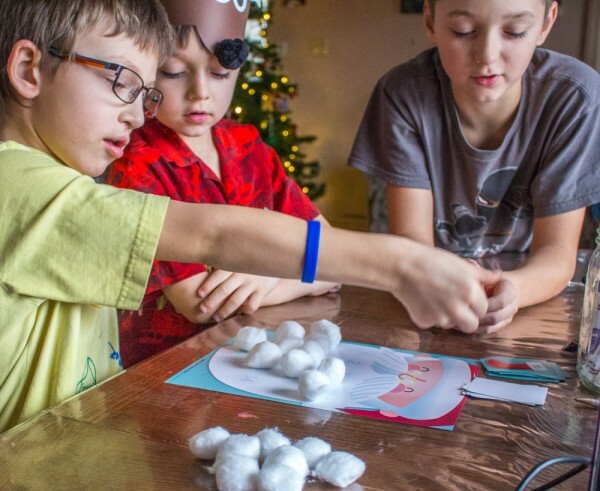 The boys were breathing pretty heavy after this game 😉 what a fun Christmas learning ideas! 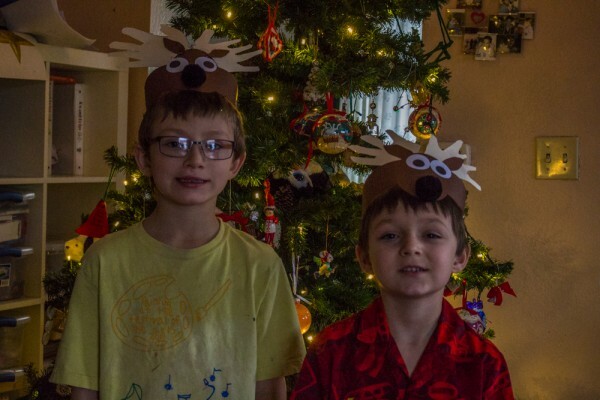 Reindeer hats was another fun activity that was found inside our Christmas theme. 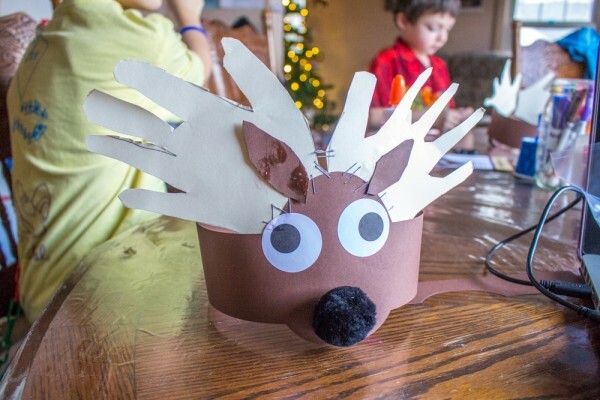 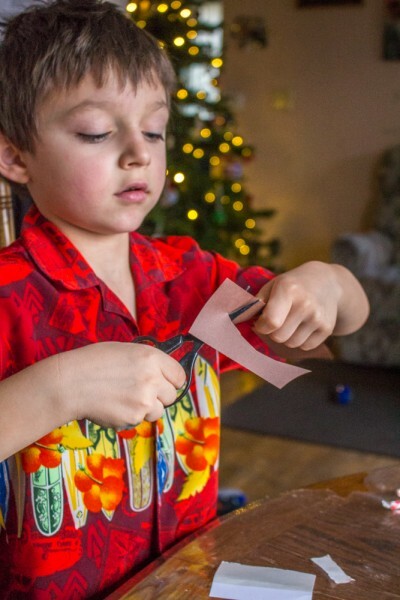 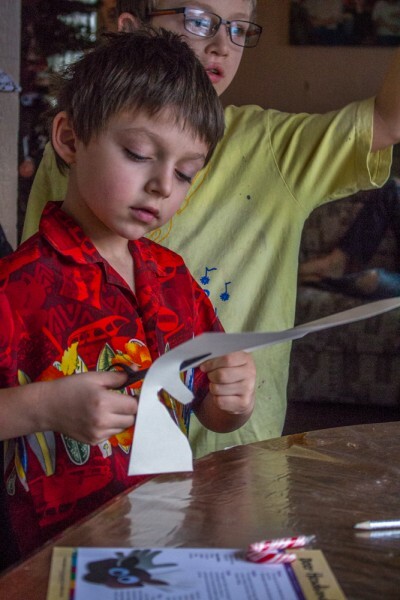 For this activity the boys traced their hands onto a paper for the reindeer’s antlers. 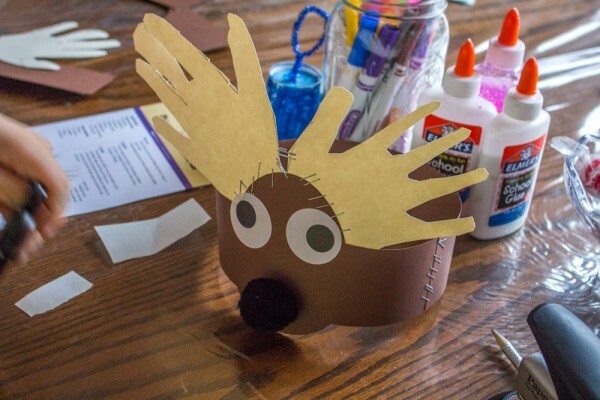 Once they finished that they stuck on the sticker eyes, put on the pom pom nose, and finally assembled the reindeer into a hat that would fit on their head. 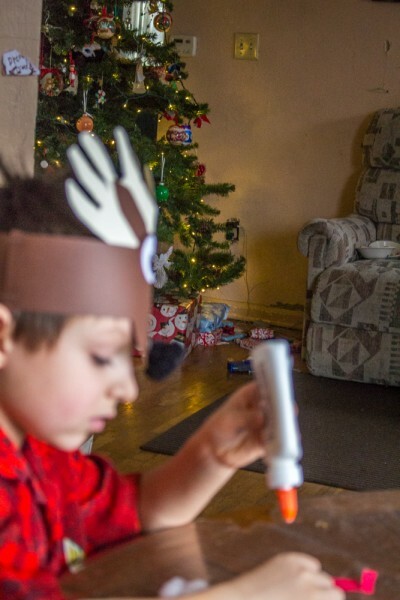 Ethan is really enjoying the stapler, which you can probably tell just by looking at his reindeer. 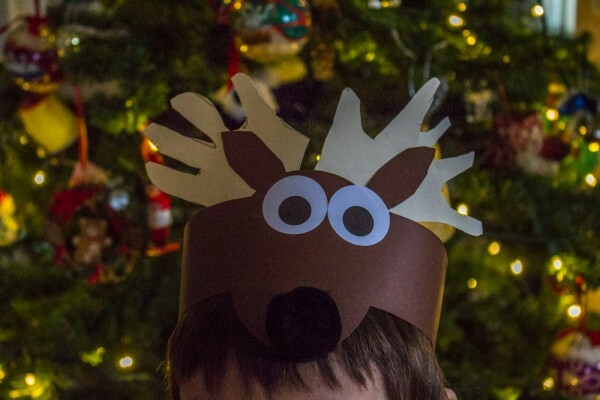 At least his antlers won’t be going anywhere 😉 ! 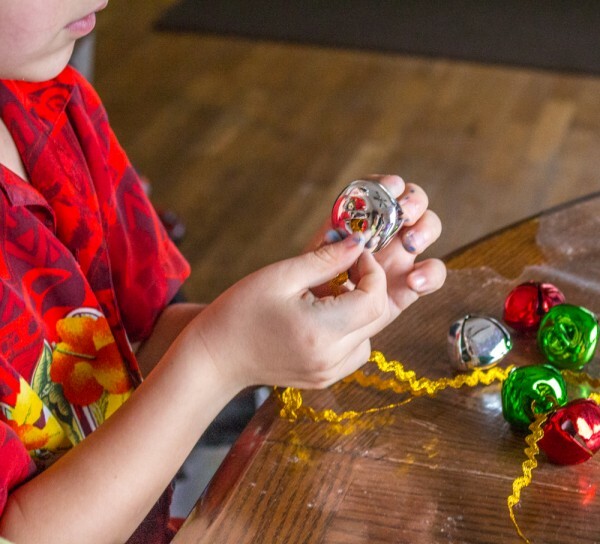 The bell ornaments were lots of fun and very easy to make. 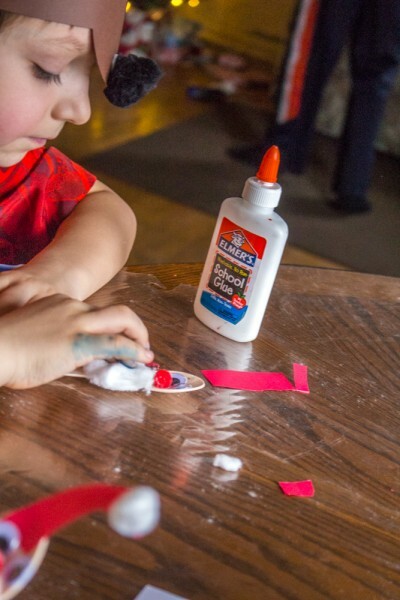 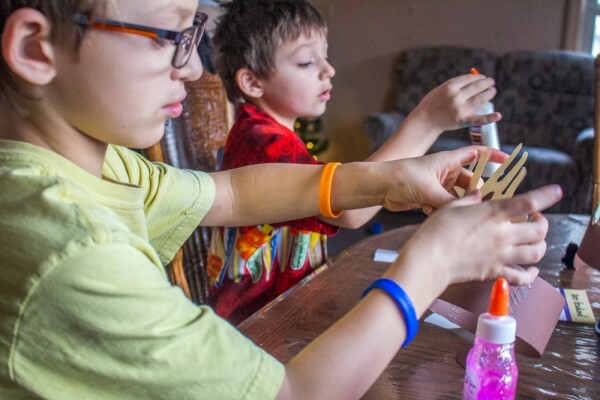 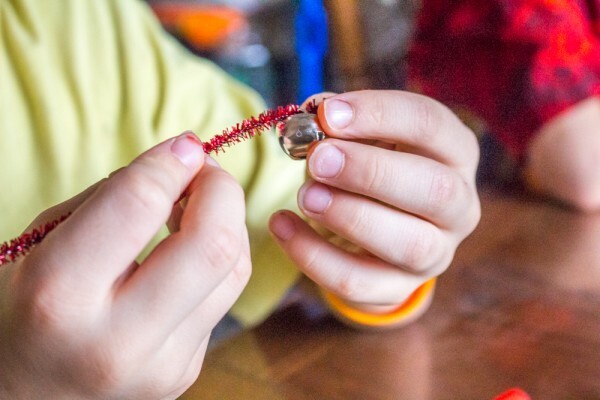 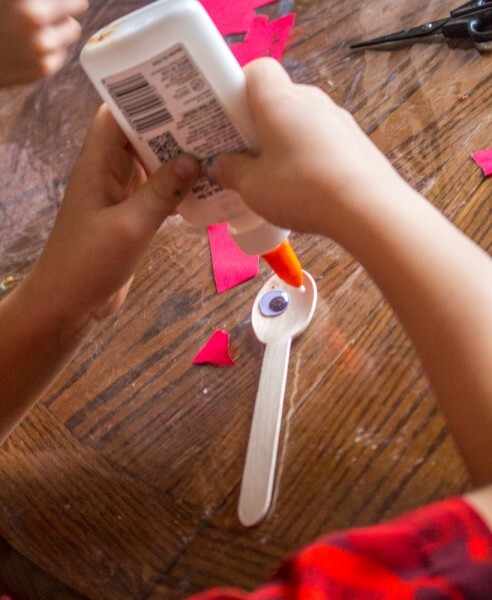 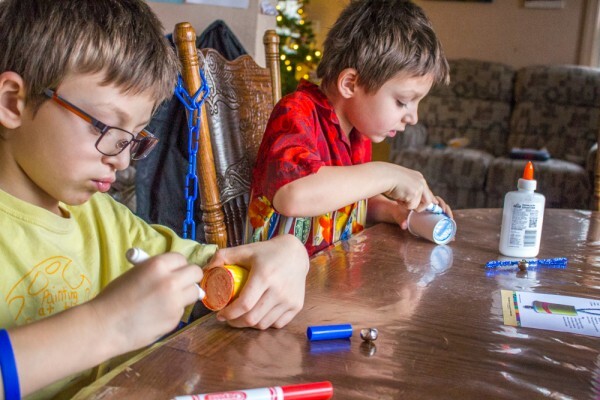 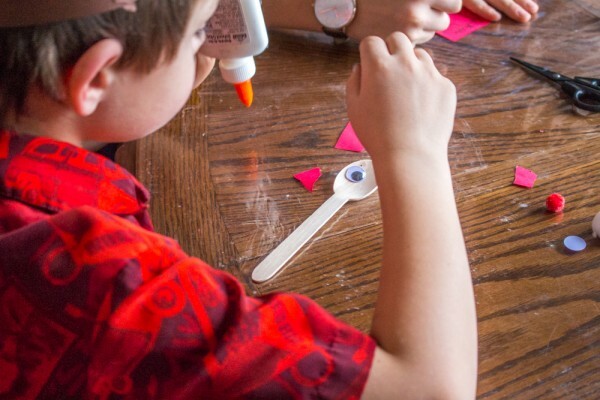 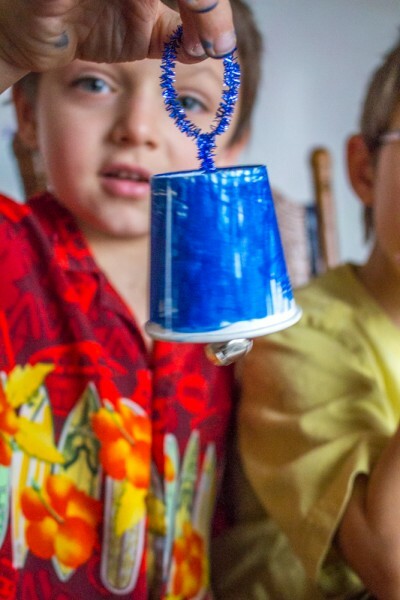 The boys started out by coloring their little cups, then strung pipe cleaners through the bottom of the cup, and then added the bell onto their pipe cleaners. 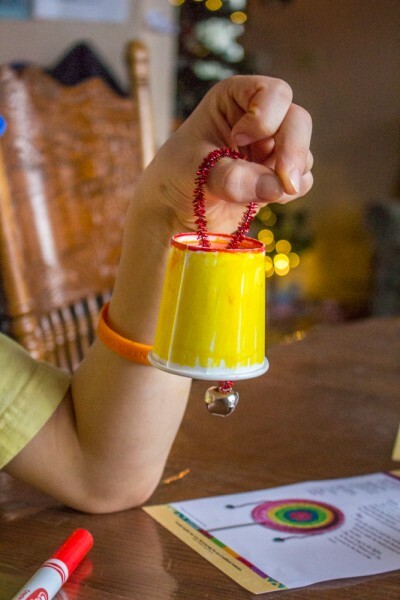 Threading the bells was great fine motor work!! 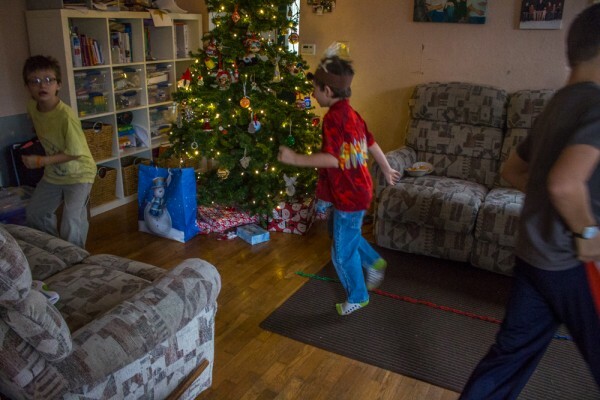 Gabe couldn’t stop shaking his bell, and I really struggled getting a picture of his bell. 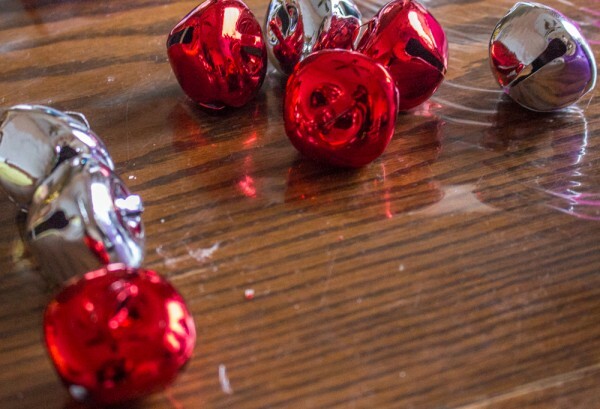 Both of the bells will now be on our tree to see every year! 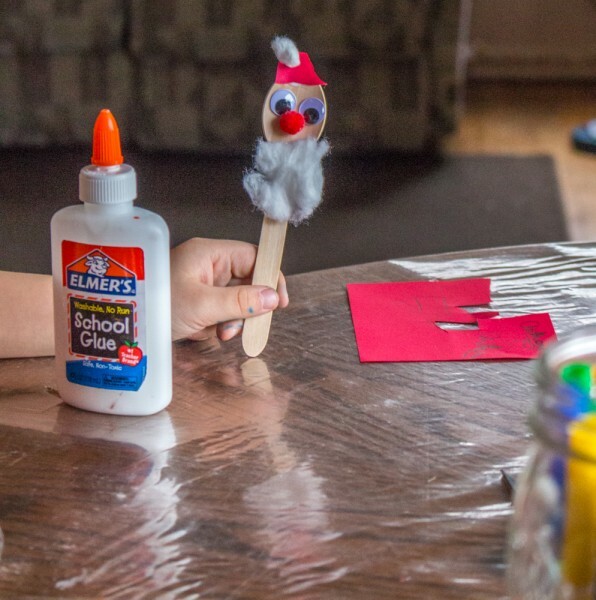 We had so much fun going through our Christmas unit with our Mother Goose Time curriculum. 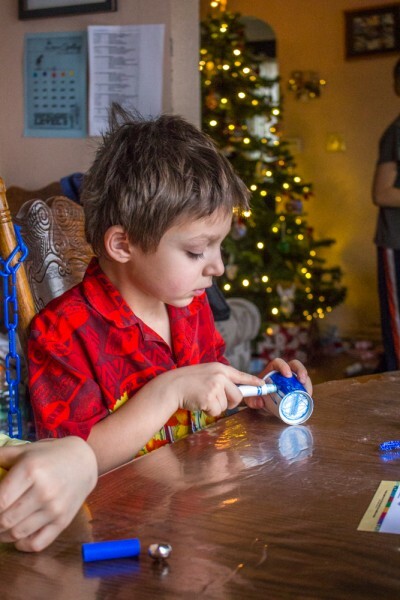 I am grateful they even include holiday fun for the kids!! 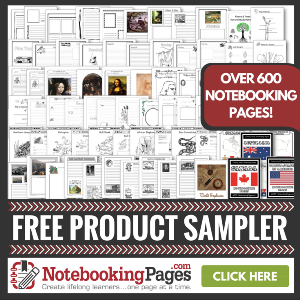 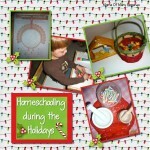 Stop over to my Christmas Ideas page for other Christmas learning ideas to try. 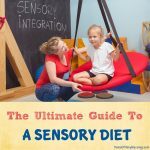 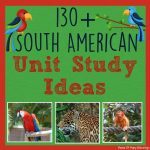 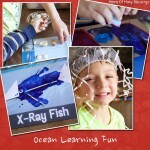 It has Christmas recipe idea, sensory ideas, crafts, unit study ideas, and lots more fun ideas!! 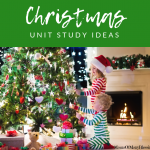 My Christmas Ideas for Kids Pinterest board has even more family friendly Christmas learning ideas. 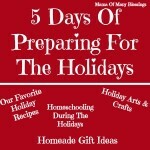 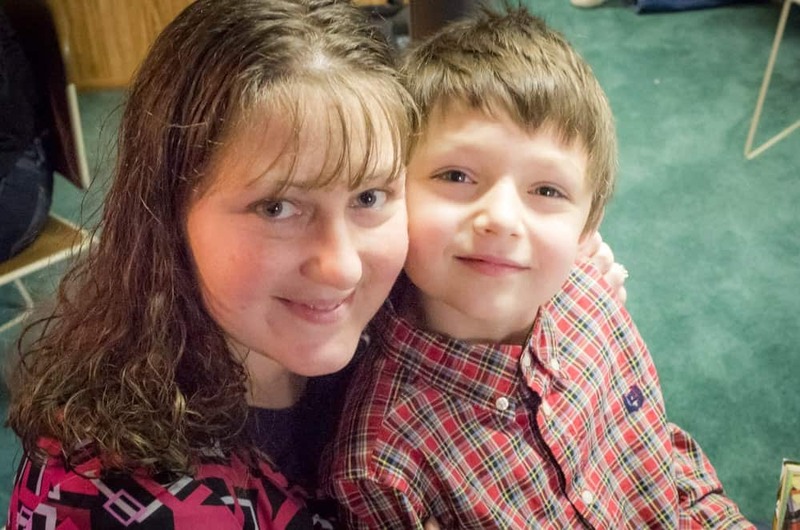 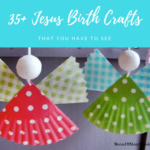 Follow Mama Of Many Blessings’s board Christmas Ideas for families & Kids on Pinterest. 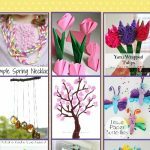 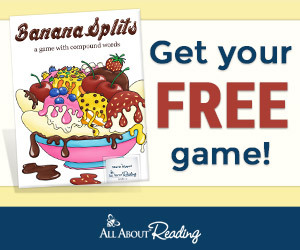 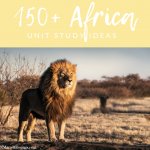 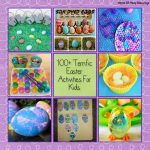 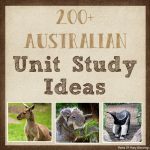 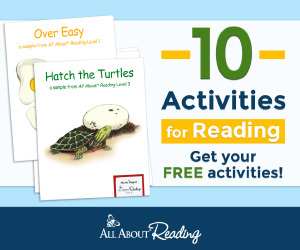 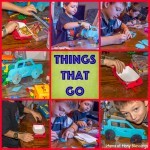 I am linking up with these great linky parties, stop over to find other great learning ideas for kids.